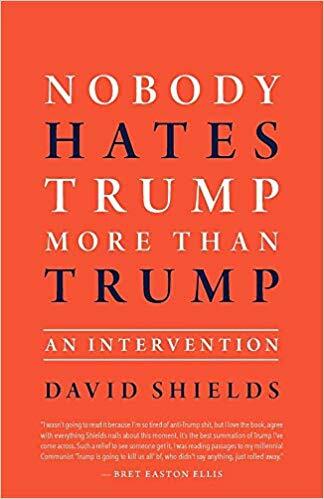 Early on in his latest book, Nobody Hates Trump More Than Trump: An Intervention, David Shields includes dialog from an interview between filmmaker Errol Morris and Donald Trump. When Morris asks, “What’s your favorite movie?” Trump responds, Citizen Kane. The eventual President goes on to explain how he identifies with the title character from the Orson Welles-directed movie, the power-obsessed, Charles Foster Kane. Just as you think that perhaps Trump has a grasp on Kane’s issues of being compassionless, having a lack of self-reflection, and his incapability of love; just as you hope that maybe Trump is going to speak about how he has himself grown from understanding the movie’s lessons; instead, Trump offers up the following advice to Kane, “Get yourself a different woman.” This revealing moment is one of many that support Shields’ argument about the President’s psychological makeup and the insecurities hiding behind the façade of a bully. With so many titles about this President and the current state of affairs at the White House and in the nation being rushed to market, Shields brings a unique perspective to the ongoing dialog. By interspersing pop-culture references, interviews with the Trump family, political think pieces, quotes from a diverse group of authors, and personal anecdotes from his own life, Shields takes the reader on a quick-paced, kitchen sink approach to understanding these current times. Shields’ approach allows the reader to pivot rapidly between trying to understand the Presidents’ self-deception and his persistent need for acceptance from the media and everyone he meets - while also looking at the bigger picture of how we as a nation are tied to his mental state and the implications for the future. Whether a reader is looking for an in-depth dive into the mental state of the current President, an examination of how words can be manipulated to influence power, an abridged collection of the sayings and thoughts of Donald Trump, or most importantly as a dire warning about how America has gotten to this point – Shields’ short book delivers the goods. Shields makes it clear in his title and throughout the book that we are in need of an intervention - we have met the enemy and he is us. Here is hoping that Nobody Hates Trump More Than Trump: An Intervention provides a path for a quick recovery. Shannon Lasater is a part-time freelance writer living and working in North Carolina.